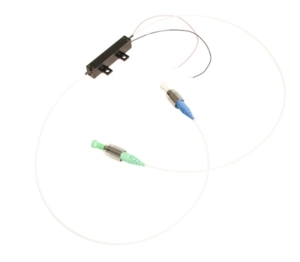 IDIL Fibres Optiques offers tunable Fiber Bragg Gratings (FBG) using piezoelectric stack and electrical voltage. A way to tune the optical wavelength (nanometer scale) of a photo-imprinted Fiber Bragg Grating is to fix it on a piezoelectric stack. When applying an electric voltage on the piezo, it creates an elongation of the FBG. Using electrical voltage to tune the optical wavelength over a small spectral range represents an innovative method. Indeed, the only voltage variation applied on the piezoelectric stack to modify the fiber grating wavelength provides great flexibility of use (Figure 1). Moreover, fixing the grating on a piezoelectric stack makes the wavelength behavior insensitive to temperature (Figure 2). It makes it suitable for various applications such as fiber sensing systems, tunable fiber lasers, high power amplifiers, telecommunications systems and other custom applications where tuning of the FBG wavelength is needed. Figure 1: The wavelength variation of a FBG of 1,7 cm photo-imprinted on a piezoelectric stack, depending on the electrical tension applied, is represented in Figure 1. The overall variation of the Bragg wavelength is 1,8 nm for a tension of 150 V. This variation is almost linear. 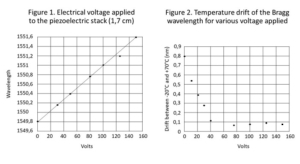 Figure 2: The piezoelectric stack compensates effects of temperature on the Bragg wavelength. For different electrical tension applied, the variation is almost linear.